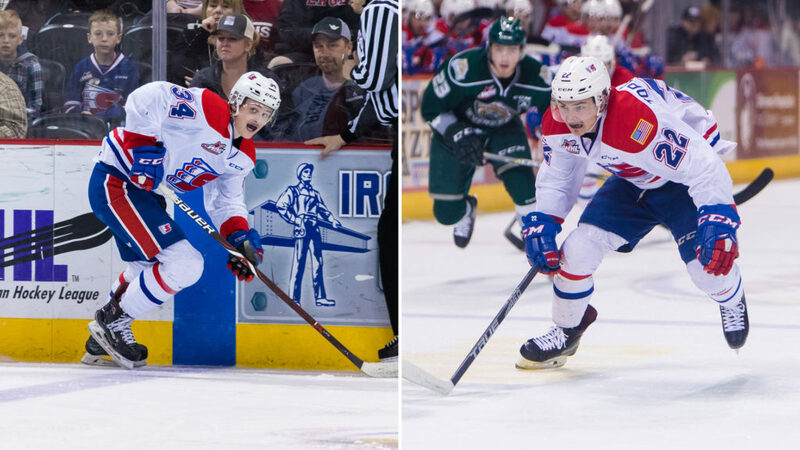 Spokane Chiefs forwards Adam Beckman and Luke Toporowski are each listed in the latest NHL Central Scouting Service draft rankings. Beckman jumped up 10 spots to 34th among North American skaters, while Toporowski remained in the top 100 (100th). Chiefs prospects Matthew Davis (24th NA goalies) and Ethan Leyh (167th NA skaters) also earned rankings. Beckman, a 6-foot-3 winger from Saskatoon, Sask., had a breakout season with the Chiefs, leading the team in goals scored with 32. He was the first rookie to lead the team in goals since the 1998-99 season (Daniel Bohac; 26) and his 62 points are the most by a first-year Chief since Roman Tvrdon racked up 70 during the 1999-00 campaign. Beckman has continued to stand out during the playoffs, scoring five goals – including two game-winners – and four assists for nine points in 10 games. Playing primarily on the left wing, Toporowski has continued to make an impact in the postseason, scoring four goals and an assist, highlighted by his two-goal performance in the Chiefs’ 4-1 clinching win over Portland in Game 5 of the first round. Davis’ rights were acquired by the Chiefs in the same December 2018 trade with Swift Current that netted the team top-pairing defenseman Noah King. While with the Spruce Grove Saints of the AJHL this season, the Calgary native posted a 2.03 GAA and .914 SV% in 35 games. He was previously ranked 30th on the North American goalies list. Leyh, drafted by the Chiefs in the eighth round of the 2016 bantam draft, played 51 games with the Langley Rivermen of the BCHL this season, scoring 15 goals and 27 assists for 42 points. The 6-foot forward calls Anmore, B.C. home. The Central Scouting rankings serve as an reference ahead of the NHL draft, held in late June each year. The 2019 NHL Entry Draft will take place in Vancouver, B.C. on June 21-22. The Spokane Chiefs have had 73 total players drafted by NHL clubs dating back to 1987. They have had at least one player selected in each of the last four drafts and 13 picked in the last decade. Four current Chiefs heard their name called: C Jaret Anderson-Dolan (2017 2nd round; Los Angeles), RW Jake McGrew (2017 6th round; San Jose), D Ty Smith (2018 1st round; New Jersey), D Filip Kral (2018 5th round; Toronto). Spokane has advanced to the 2019 Western Conference Championship! The Chiefs will take on the Vancouver Giants in the best-of-seven series, beginning on the road for Game 1 on Friday, April 19 (7:30 p.m.). The Chiefs will host Game 3, Game 4 and Game 6 (if necessary) at Spokane Arena on April 23, 24 and 29. Tickets for the Western Conference Championship are available now online, over the phone at 509-535-PUCK and at the Spokane Chiefs’ Ticket Office at Spokane Arena.